The truth is that pets are no different than our beloved friends and family members. They need and deserve special care. 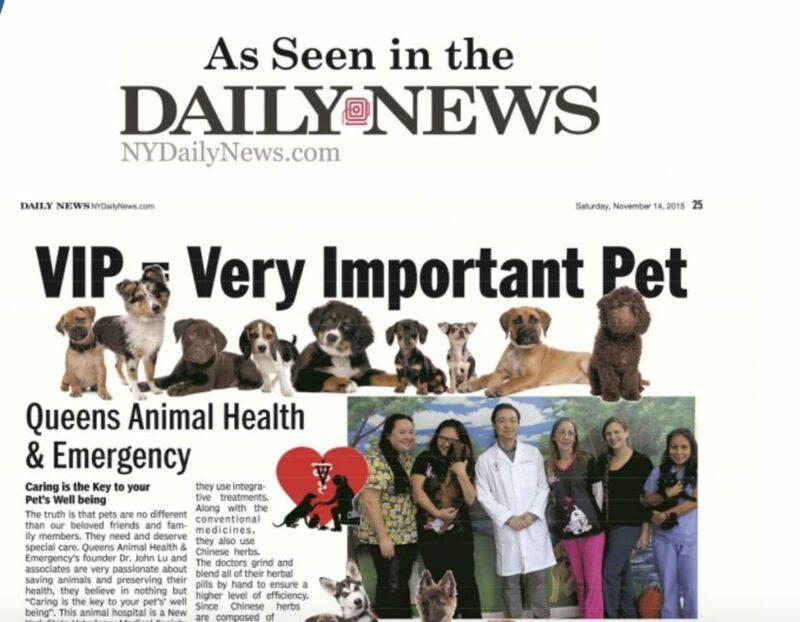 Queens Animal Health & Emergency’s founder Dr. John Lu and associates are very passionate about saving animals and preserving their health, they believe in nothing but “Caring is the key to your pet’s’ well being”. This animal hospital is a New York State Veterinary Medical Society Accredited full service veterinary facility, including emergency care, regular health care and surgical care. Only few animal hospitals in New York City and surrounding areas hold this honor. Most people don’t realize how many health issues an animal could have. Animals fracture limbs, get cancer, depression, contract illnesses and diseases etc. Animals have all the same health issues as we humans do. So Queens Animal Hospital provides services ranging from vaccinations, spays/neuters, tumor removals, to orthopedic surgeries and chemotherapy, they treat a wide variety of cases from dental care to mental health issues. There are even grooming services for all of those bad hair days. Dr. Lu and his team have also dealt with many unique cases in their emergency room. Recently, they saved a cat, whose skull had been penetrated by a stray bullet. He is also one of the first veterinarians to use in house stem cell therapy on animals. What’s special about Queens Animal Health is that they use integrative treatments. Along with the conventional medicines, they also use Chinese herbs. The doctors grind and blend all of their herbal pills by hand to ensure a higher level of efficiency. Since Chinese herbs are composed of natural ingredients there are less side effects than conventional medications. They have created nearly 50 different blended herbal pills that cure a wide variety of illnesses. These medicinal herbs are safe for human consumption as well, just different doses. Pets deserve the best care and high quality medication to ensure a healthy, long lifetime. So this integrative style of treatment ensures the best medical solution, whether it’s an eastern treatment, or a western one. Another Eastern treatment used by Queens Animal health is acupuncture. Just like humans, each case requires individual treatment. In some cases, surgery is too invasive and acupuncture is the best solution. This is one of the few animal hospitals that use acupuncture. It is a 4,000-year-old treatment that serves as a cure for arthritis, allergies, paralysis and many more. This is a safe natural way to handle certain illnesses without conventional medication or a surgical procedure.